Feel better fast. 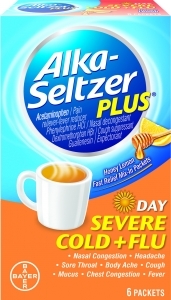 Mix the Alka-Seltzer Plus Honey Lemon Day Severe Cold + Flu Fast Multi-Symptom Packet into eight ounces of hot water and sip the soothing beverage within 10 to 15 minutes. Experience the steam and the tasty drink as it infuses powerful relief through your whole body. These packets temporary relieve these symptoms due to a cold of flu: minor aches and pains; headaches; sore throat; cough; nasal congestion; sinus congestion and pressure; help loosen phlegm (mucus) and thin bronchial secretions to rid the bronchial passageways of bothersome mucus; temporarily reduce fever. Do not take more than the recommended dose. Take every 4 hours; do not exceed 5 packets in 24 hours or as directed by a doctor. Adults and children 12 years and over: dissolve contents of one packet in 8 oz. hot water; sip while hot. Consume entire drink within 10-15 minutes. Children under 12 years: do not use. Active ingredients (in each packet) - purposes: Acetaminophen 650mg - pain reliever/fever reducer. Dextromethorphan Hydrobromide 20mg - cough suppressant. Doxylamine Succinate 12.5mg - antihistamine. Phenylephrine Hydrochloride 10mg - nasal decongestant. Inactive ingredients: Acesulfame Potassium Anhydrous Citric Acid, Compressible Sugar, D&C Yellow #10, Dental-Type Silica, FD&C Red #40, Flavors, Pregelatinized Starch, Sodium Citrate, Sucralose, Tartaric Acid, Tribasic Calcium Phosphate.